In 1971, David and Marlowe Klitzky founded The Great Frame Up on the unique theory that if customers were allowed to “be part of the art”, it would not only enhance their buying experience but would also increase appreciation for each finished piece. Over 35 years later, Do-It-Yourself framing is the most enjoyable way to save time and money (and gas) creating your own masterpiece. On the Spot framing for a customer, with assistance from our design staff, that selects the materials, the staff cuts them and then receives step by step instructions on how to easily assemble a finished piece. The customer puts their project together using unique tools, cleaning the glass and assembling the artwork into the frame. Our staff is always there to help you and assist with every step. We also offer On the Spot service for mats, glass and mounting. 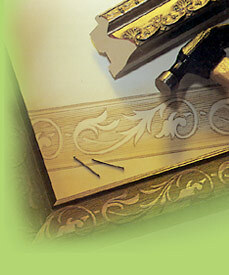 Cut & Keep Do-It-Yourself orders are placed and completed by the customer on a different day. You select your materials, pay for the order and we cut and keep and build your order until you have the time to come back and complete the project. Custom Framing service is also available at each one of our stores. Custom Orders are projects that will be completed entirely by our staff. There is a labor charge for this service that is dependent on the size and complexity of the project. The turnaround time on custom jobs is when you need it.